As George RR Martin noted on his blog, on May 2nd, near southwestern Siberia, a 47-year old man named Cairo Nurmagambetov found a missing two-year old girl by noticing a flock of crows circling over a field. Despite manning a search force of 400 police officers, 200 volunteers, and 15 dog handlers as well as using thermal imaging equipment, it wasn’t the man power or the technology that saved the day but rather a Game of Thrones fan. Two-year old Alexandra Spirinka disappeared eighteen hours earlier while playing outside her home in village SibNIVI near Omsk, Russia. While driving 7.5 miles (12 km) away from the village, Cairo Nurmagambetov noticed the crows circling a field; he drove over to investigate and spotted the little blonde girl. This Russian-language video shows the dramatic reunion of the toddler with her parents. One Russian-language edition of A Feast for Crows shows the “Crow” Jon Snow on the cover. Here’s what the articles didn’t say – because it’s pretty awful — and what may be interesting to Game of Thrones fans awaiting next season. Although crows dine on fruit, nuts, snails, snakes, grubs, and other creatures, their major food source is carrion, or dead meat. On May 1st and 2nd, the temperature in Omsk was moderate in the day, the high was 76° F (23° C) but chilly at night (44° F (7° C)). The toddler, crying and likely wandering in circles lost in the field, was visibly distressed. The crows circled like vultures; they were eagerly anticipating the girl might soon die. Then the crows would pick her bones clean of flesh. A veritable feast for crows. There must have been a lot of crows because the man spotted them from a distance far enough away to drive to the field. Why would so many crows congregate? Because in the winter – and in southwestern Siberia the tail end of winter is likely in late April, early May – crows roost together in large flocks of sometimes thousands of crows, known as murders. Crows start leaving their roosts in late March in North America for breeding season. I have no idea when crow breeding season would begin in southwestern Siberia, but even if the crows weren’t roosting nearby, a vulnerable child’s cries might attract them. Next season on Game of Thrones will center on George RR Martin’s fourth novel, A Feast for Crows, which is about the War of the Five Kings winding down, and Dances with Dragons according to this Nerdalicious article . A Feast for Crows is an appropriate name for a the fourth installment of a series of novels primarily about the cost of war. The first novel, Game of Thrones, is about the inciting event, the quest for the throne and how it sparks a succession war. The second novel, A Clash of Kings, is about the rising action in this story arc, the conflict between rival claimants to the throne and how it evolves into civil war and the third novel, A Storm of Swords, continues and amplifies this story line. Crows roosting. Source: Wikimedia Commons. At the end of Season 4, and A Storm of Swords, the Lannisters have successfully annihilated the senior leadership of House Stark. In turn, however, House Lannister has effectively lost its senior leadership: King Joffrey is dead. Tywin is dead – his legacy and heir, a hated son, killed him. Tyrion has vanished. Jaime, sworn to never wed in the Kingsguard, is left without his fighting hand. A Russian language edition of A Feast for Crows. The title, A Feast for Crows, presumably refers to the fact that in the Middle Ages, flocks of crows followed the long army trains as they wove their way through the countryside. Crows — the smartest of birds – quickly learned this medieval death machine was a sure source of a steady meal. After the battles, the crows descended on the fields to rip the flesh off the corpses. It’s worth noting that the connection between crows and scavenger birds of prey may be clearer in other languages and cultures. The Russian language edition of A Feast for Crows is known as <<Пир стервятников>> which translates to A Feast of Vultures. I don’t speak Russian so I don’t know if this was done to make the title more compelling or alliterative in Russian, or if the Russian publisher wanted to clarify the reference in the title. In terms of the little girl’s rescue, what the news stories don’t say is that rescuer Cairo Nurmagambetov phrase, “I knew that the crows meant there was something happening” might have been a euphemism. 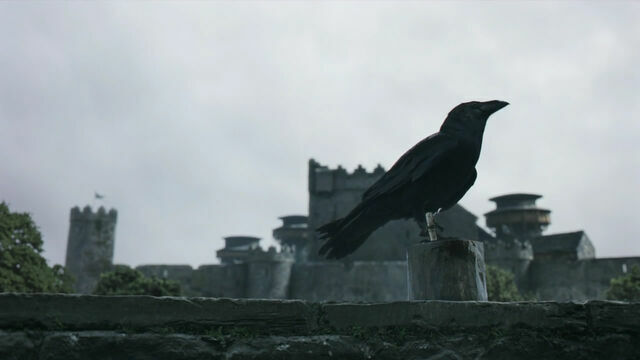 Some newspapers assumed that when Nurmagambetov read meaning into the flock of crows, he thought of the shows crow references: the Night’s Watch and the three-eyed crow. If Nurmagambetov has read the books, he may have known the title A Feast for Crows is to scavenging birds of prey circling for the dead. In the case of this lucky young girl, thank goodness for George RR Martin’s evocative title and Game of Thrones‘ fan Cairo Nurmagambetov. Is this Olga stepping into the breach while Jamie is busy? Did the man who found the little girl do so because he had picked up on the behaviour of crows (or vultures??) from what he had read in “A Feast for Crows” or was it just a coincidence? (I can’t get the video to translate into English). Thank goodness there was a happy ending – though the little girl seems remarkably unconcerned. Yes, Olga has been very kindly stepping in – thank you Olga so much. I noticed she has been answering the comments threads – thank you *so much* Olga. One of my dogs was extremely ill last week, congestive heart failure. I spent most of the week going to the vet hospital, where she was in an oxygen cage. Unfortunately, she didn’t make it and died on Saturday. I’m still pretty down, so I’m taking a little time… Olga has kindly written a few articles to help out – so kind. Sorry – I’ve just read the last paragraph of the article (I was sure I’d read it in full) and see that the original is ambiguous as to whether the gentleman realised something was amiss birds’ behaviour from the books or not. I regret having to make another post but as there isn’t an edit button……. I have actually never seen more than two or three crows together, and we have plenty of them here. I’d be very surprised to see so many of them circling a field. Sorry about the dog, Jaime. Aw, thanks. That’s really sweet, Jun. I was hesitant to mention it, but I wanted people to know why I might not be that active in terms of publishing or replying to comments. She was eighteen years old, but I adored her and I still hoped against hope she could be healed. So, I’ve been pretty choked up about it.